Here is a shot of Julia’s Daniel’s and Alaina’s lunch bag for school. There is always only one single use plastic, fruit cup. Daniel and Alaina are not big on eating fruit, and we have always had fruit cups for snacks at school. It is something I want to steer from, but I believe it needs to be replaced with something else. I would like to try and make my own, but time is very pressing. 2 times I bought pears to experiment and make our own fruit sauce, but I did not take the time, and they all went to waste. I will have to brainstorm with the kids to come up with a different alternative! 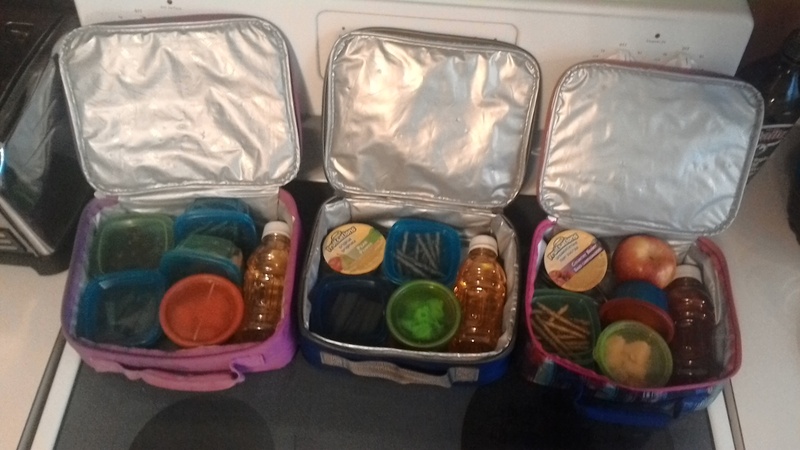 Julia- Apple juice in a reusable container, pretzels, chicken, orange pepper, grapes, crackers and carrots. 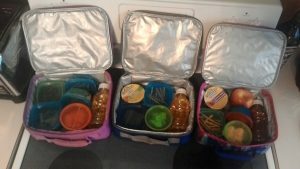 Daniel-Apple juice in a reusable container, pretzels, bran flakes, fruit cup, chicken and carrots. Alaina- Fruitopia in a reusable container, pretzels, cheese, apple, fruit cup and chicken. Everything (except the fruit cup) is in its own container. I would like to make some reusable cloth bags, or like my husband suggested, just wrap the snack in a piece of cloth. Don’t need a bag. He is right!! I will be upgrading to cloth soon. The containers do take a lot of space and time to wash. Cloth can be put in the washing machine with a load, no problem at all. Left over meats from supper like chicken and steak. Sandwich meats like Beef. Pretzels, crackers, sunflower seeds, Bran flakes, cheerios, shreddies and home made granola bars. Apples, carrots, berries, peppers, cucumber, fruit cups. Juice from home, poured into reusable containers. (These containers were the small cranberry drinks. The cover twists on good creating a tight seel. Rubbermaid juice boxes leak when laying down). Noting all this information down is encouraging me to just ditch the fruit cups. I think I will. See, the 10 minutes it took me to write this article, I changed my mind. Just enough push. Sometimes that is all you need, a nudge to move forward.